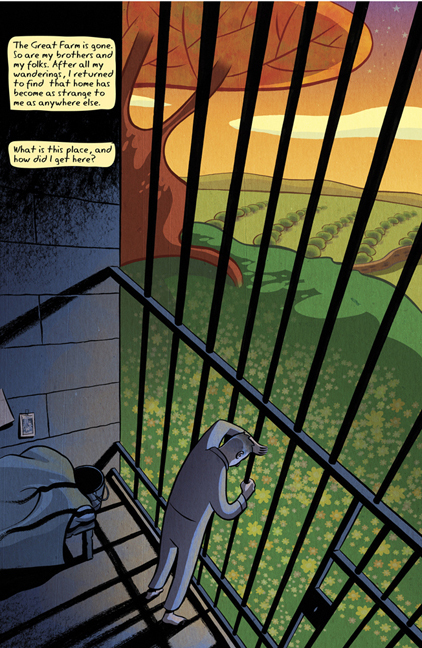 Young Adult Library Services Association “Great Graphic Novels for Teens” selection. Even when the fighting on one of the world’s many battlefields sees a rare moment of silence, the little wars of our own lives rage on without pause. We are, it would seem, destined to move from one conflict to another – with our families, our friends, ourselves and the world around us. 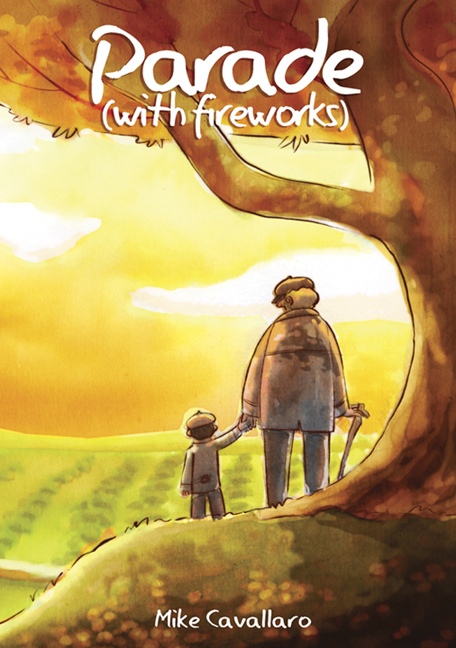 It is these little wars that Mike Cavallaro delves into in his Eisner nominated short series, Parade (with fireworks). On the heels of the First World War, Italy was a nation in turmoil. Members of the burgeoning fascist and socialist parties struggled publicly and privately for the future of the country. 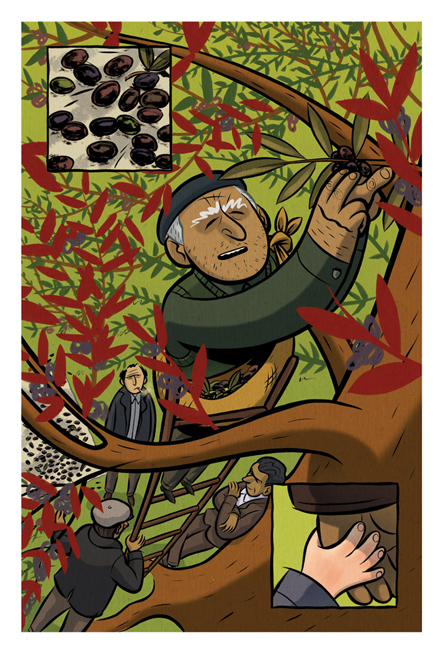 This story is an adaptation of an oral history passed down through generations of the author’s family, the tale of Cavallaro’s grandfather, Paolo. The oral history put to paper here is a charming and poignant relic, an entertaining and enlightening slice of history that is both personal and political, exploring the subtle battles between family members and the louder ones between ideologies. In telling an oral history, much less one that is deeply entwined with his own family and has been passed down through the generations, Cavallaro understands that he can’t craft an objective history, and doesn’t try to. 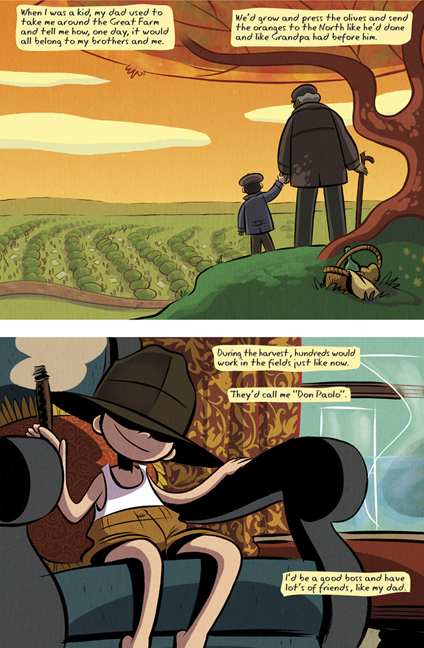 Instead, he transforms an old family story into a near-fable. Private conversations are filled in and details assumed as necessary. Most strikingly portrayed are the fascists in the piece, almost comically villainous, all bristling moustaches, barking insults and disgusted sneers. They are, without exception, a group of guys you wouldn’t be surprised to find tying a hapless maiden to a railroad track in their off hours, cackling maliciously. But ultimately, it is this very cartoonishness that makes the sudden violence of the tale all the more shocking and effective. 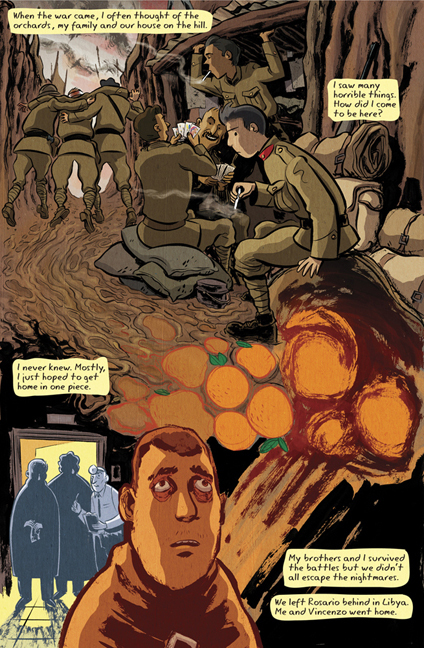 Parade (with fireworks) is a pugnacious sort of story – spanning only a short time it covers a lot of ground, touching on the time between wars, of struggles for national power writ small, and of silent conflicts that rend families. 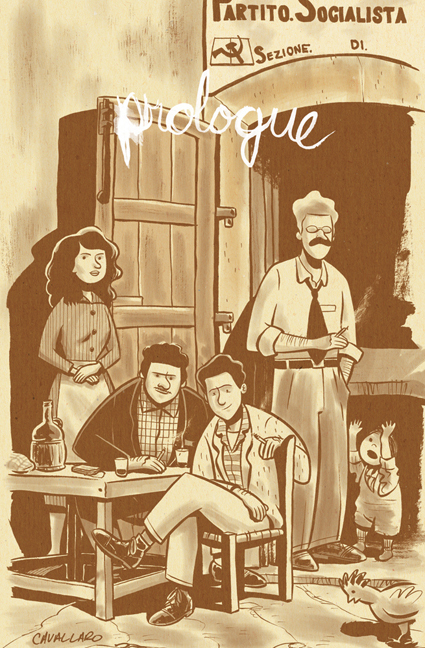 Clocking in at just over 60 pages, it’s a little story, a small tale of family, violence and betrayal set in a time of turmoil and mistrust, and the tale is lent a formidable nostalgic quality by Cavallaro’s gorgeous, singular artistic style. 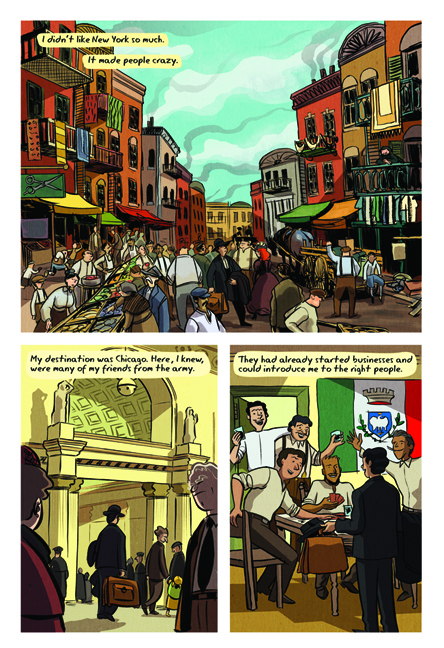 The beautifully painted pages of Parade (with fireworks) take as much inspiration from classic art styles, notably Impressionism and Futurism, as they do from the classic Sunday funnies. 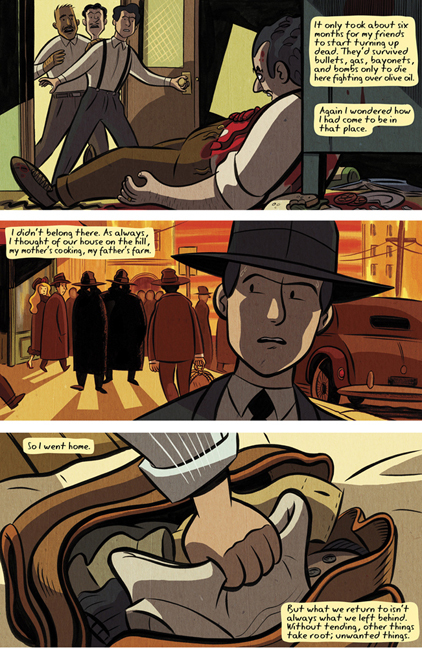 The work’s climatic gunfight brings to mind Will Eisner channeling Umberto Boccioni. Brilliantly cartooned figures battle it out against striking red backdrops, dotted with brilliant blues. The tip of the hat to futurist elements does much to help cement the story in a unique place and time, a strange but somehow fitting homage to the work of a generation of Italian artists who were by and large proponents of fascism, placing them firmly in the villainous camp according to the logic of the tale. Whether he’s portraying sunlit festivals and bloody gunfights or dank prison cells and tense courtrooms, Cavallaro’s mastery of light and shadow is as impressive as his versatility as a visual storyteller. Cavallaro displays a great talent for telling a whole story in just an image or two, but also knows when to play a scene along for maximum dramatic effect. And while the artwork is haunting and gorgeous, Cavallaro is also a terse and talented writer, displaying a gift that seems drastically undervalued in many current comics: brevity. While the narration can go a bit talky at times, the dialogue throughout Parade (with fireworks) is downright Chandlerian. Each line feels totally necessary. Every word has a purpose, providing context for relationships or fleshing out characters. In two full issues, not one word feels wasted or excessive, a true feat in an industry whose writers more and more tend towards chatty, Sorkin-esque exchanges between characters that spend sentence after sentence without advancing a plot or even expressing an idea. 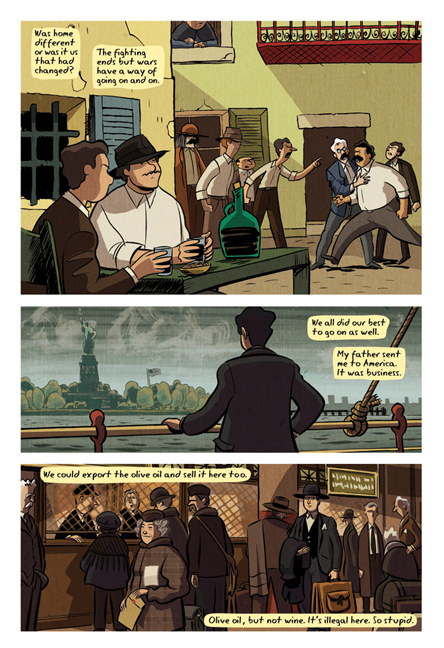 Born as a labor of love on web comics collective Act-i-vate, Parade (with fireworks) was eventually picked up by the Image Comics imprint Shadowline, a studio run by creator Jim Valentino that is dedicated to bringing singular new voices and styles to mainstream comics. And while it has taken some time for it to get its due, it’s a credit to the industry that a what began as a little web comic inspired by the stories of previous generations can get picked up by a major publisher and end up an acclaimed miniseries nominated for the industry’s highest honor.